Roulette Display Boards | Matsui America Inc.
CYCLOPS is the family of roulette reader displays with integrated camera. The CYCLOPS displays are easily installed and used. They do not require the permanent technical service. LED displays single/double-sided. 16 last winning numbers. Classical style. Any frame color. LCD display 22” and 24”, single/double-sided. 16 last winning numbers. Statistics on simple chances, dozens/columns, hot and cool numbers. Real-Sim* technology. Logo, casino design. LCD display 22” and 24”, single/double-sided. 16 last winning numbers. Statistics on simple chances, dozens/columns, hot and cool numbers. Real-Sim* technology. Logo, casino design. Min/max bets. Creeping line. TV/any video information. Real-Sim* is displaying the animation of roulette wheel with the same speed and rotation direction of the real roulette wheel. 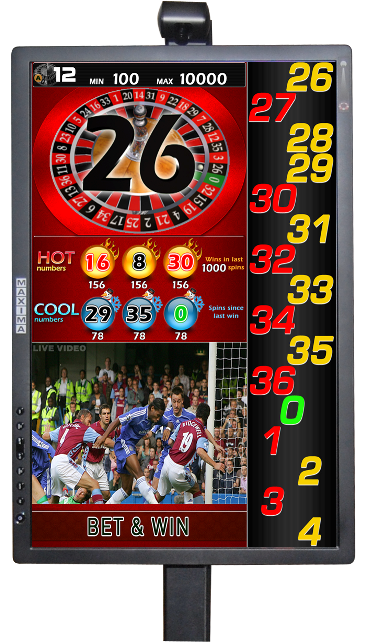 TFT winning number AR displays can be installed on any type of roulette wheel. Single or double sided: TFT-01 and TFT-02. Automatic detection: laser or video camera reader TFT-01-0, TFT-01-00, TFT-02-0, TFT-02-00, TFT-01-0 VIDEO, TFT-01-00 VIDEO, TFT-02-0 VIDEO and TFT-02-00 VIDEO. For single or double zero wheels: TFT-01-0, TFT-01-00, TFT-02-0, TFT-02-00 TFT-01-0 VIDEO, TFT-02-0 VIDEO, TFT-01-00 VIDEO and TFT-02-00 VIDEO. Automatic detection: laser reader or video camera. Light gold or chrome standard finishes. Optional statistics analysis program (only for single zero wheels). Optional winning bets dealer calculator.